Marla Leigh Goldstein is a Grammy nominated Percussionist, Flautist, Composer and Educator. She is an internationally recognized teacher and performer, who has presented throughout the USA, Canada and Europe. 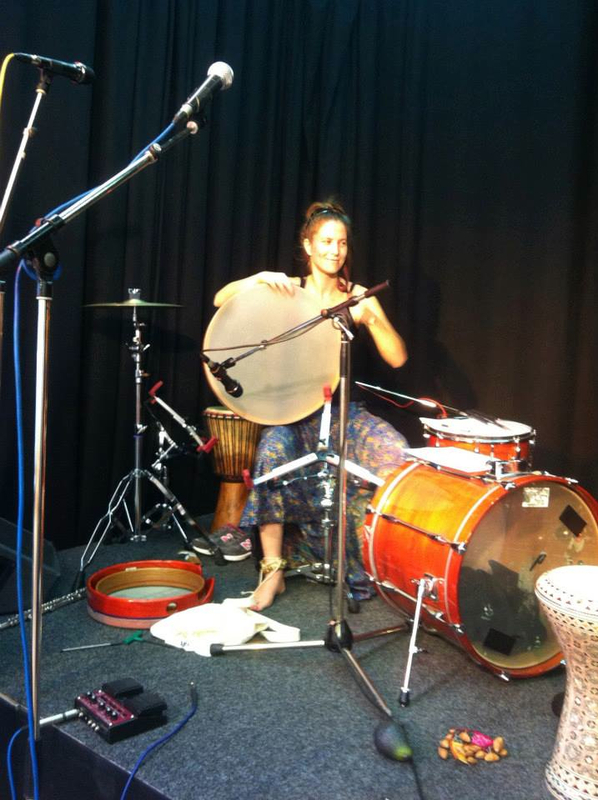 Marla carries the gift of being an inspiring and energetic educator, and soulful, charismatic performer..
Marla also offers Rhythm & Rejuvenation Retreats”, co-ed drumming & wellness retreats at places such as, Esalen Institute, Harbin, Kalani and other beautiful places around the world. Marla also offeres frame drum focused educational workshops & residency programs for conventions, Yoga Studios, Universities, and Synagogues. Marla has presented clinics at evens such as Tambouri Mundi Festival in Germany, Zurich Arts Festival NAFDA Festivals in Vermont and New Jersey and California PAS Day of Percussion and Asheville Percussion Festival. Marla also loves COMPOSING – She writes dynamic cross-cultural meditative world music scores for film, tv and healing arts DVD’s. Marla’s original music can be heard on Hala Khouri’s yoga DVD, “Yoga for Stress Release”, Janet Stone’s iphone Yoga application, the movie “Bold Native”, and short animation, “The Cellist”. She has also been commissioned to compose music for University of Kentucky and Brooklyn Middle School. Marla performs with her own ensemble, as a soloist and with various groups. Her popular performances have been at places such as: The Skirball Center, The Knitting Factory, Luzerne Music Festival, Bali Arts Festival, Calarts, UCLA, Hawaii Arts Festival, Sacred Music Festival Los Angeles, Topanga Earth Day Festival and the Harmony Festival. Marla passionately believes in the power of music to help transform consciousness. As a composer, her music has been featured on Hala Khouri’s yoga DVD, “Yoga for Stress Release”, Janet Stone’s iphone Yoga application, the movie “Bold Native” and “The Cellist.” She was also commissioned to compose music for University of Kentucky and Brooklyn Middle School. Marla has shared the stage with incredible artist such as Grammy Winner Percussionist, Glen Velez, John Bergamo, Pandit Swapan Chaudhuri, Trichy Sankaran, Poovalar Srinivasaan, Alfred Ladzekpo Nyomen Wenten, Craig Taubman, Josh Nelson, Hand’s Onsemble, Jai Uttal, Donna Delory, Joey Lugassy, Saul David Raye, and Suzanne Sterling. 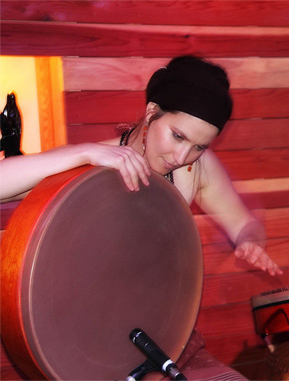 Marla received a Bachelor and Master Degrees in Flute, Percussion and Composition from California Institute of the Arts, and has also studied at Ali Akbar College in San Rafael and at the Bhavan Center in London, England, She was fortunate to study drumming with some of the best in the business. Her teachers/mentors include 4Time Grammy Winning Percussionist, Glen Velez, the late Frame Drum scholar Layne Redmond, meastro Frame Drum/Percussionist John Bergamo, Randy Gloss, Meastro Swapan Chadhuri, Poovalar Srinivasaan, Alfred Ladzekpo, Kobla Ladzekpo and Trichy Sankaran. Marla is available for touring + recording for ensembles, artists, dance companies – looking for that special world music flavor – with percussion and/or flutes. Can read music improvise easily in any meter and comfortable playing to click track in all speeds. In-home ready to go set up for pro-audio recording for artists and ensembles.